Verizon's Skype client shuts down Wi-Fi on Android phones? According to Skype Journal, Verizon customers using an Android model cannot use the Skype client and Wi-Fi together at the same time. Something in the software disables theWi-Fi radio and the user gets a message that reads, "Skype mobile does not currently work on WiFi and requires switching to a Verizon Wireless data network connection. This may affect other apps using a WiFi connection." Big Red blames the problem on an Android glitch that requires the user to disconnect from a hotspot before running Skype Mobile. Verizon also points out that because the app runs over the carrier's voice network, certain requirements must be met, including certain wiretap laws. Thus, the more secure 3G network must be used instead of Wi-Fi. The complaint here is that by forcing calls to be made over 3G, Verizon customers are using minutes that they had hoped to save. Verizon says it is working with Google to correct the glitch. 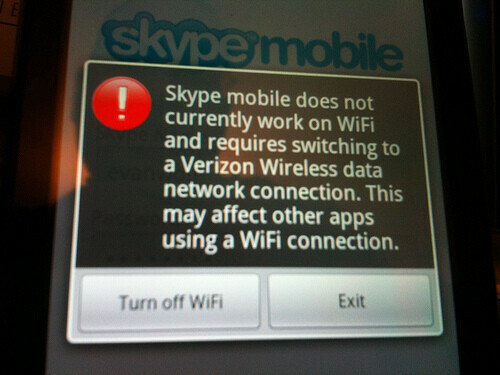 The Skype Mobile utilizes the regular switched network on VZW. It does not use data. This has been clearly stated by Skype and VZW. Skype to Skype calls using this app does not consume rate-plan minutes. This app installs a dialer and when you place the call, it routes it through that dialer. Not unlike Google voice, but without the enhanced Google features. I believe the chat/messaging feature rides over the 3G data side and could be what’s prompting the data connection validation. But to your point some users may only use it for voice calls! Well, since you can't have a Skype capable phone without paying for an Unlimited Data plan at minimum $29.99/month, what's the complaint? Don't like the convienence of using your CELLPHONE to get FREE CALLING? Then use your notebook if it's so big a deal! The IM feature uses data on EVDO or 1X, but data doesn't use minutes and handset data is unlimited. This is not the first time VZW devices have had an issue sharing Wi-Fi and data/3G, it’s not just Android. The same issue occurred with testing on the Imagio, which is running WM. The same disruption of specific carrier services occurs when Wi-Fi is enabled. You lose features such as Visual Voice Mail, MMS messaging and other various VZW sites are not accessible via the browser. I can only speak for Skype on a RIM device personally – but wanted to share these specifics While running Wi-Fi I am able to retain dual connection with VZW and a Wi-Fi service of choice. The “RIM” Skype application must be specifically designed to route over VZW, and does not require Wi-Fi to be disabled, this is my assumption however the end result is it works! To the contrary if I shut down my VZW 3G connection the remaining data apps run just fine over Wi-Fi, however Skype will go offline. At first I thought this odd however but based on this news now I see why. I guess those who tested this don’t realize many of us USE Wi-Fi ? My point is not to shadow those on Android, I myself am looking at the Incredible using Android – VZW needs to FIX Skype to Route over VZW ONLY and not cripple the device! The writer is wrong in saying that Verizon is trying to get you to use your valuable minutes by turning off the wi-fi. Using the Skype Mobile App will never use your minutes. That's the point of the app. Good catch, the call mimics a traditional voice call on in and outbound. No airtime minutes are being used during those calls. This seems to affect wifi in general. As soon as I installed the Skype for Android app, I started having issues toggling wifi on/off. Uninstalled app, no more issues. Good thing I have no use for Skype on my mobile. How is this ruining anything? You dont know what your talking about obviously...go back to Perez Hiltons gossip site. Your Skype works ONLY over WIFI. Get it right, dumbass. I think he was talking to jcrow saying his skype on his iphone only works over wifi and not the AT&T network. Not 100% sure though. Just to add insult to injury.... Whats the title of this article phonedemocracy? Yea... thought so. If that's the case then i'll apologize for the rant but it does say in response to my comment. I think most people just like to complain just to complain... I'm sure a group of people somewhere cried out for Skype on their mobile phones. Now its here, but that's not good enough...still complainin. Data is unlimited...as far as I have tested, my DROID runs the same speed using 3G as it does on WiFi...so why would I need WiFi? Ok...some apps run off WiFi. Why can't I just Skype it up and then when I'm done with Skype...go back to the app that I was using. It's not going anywhere. Why do I have to talk on the phone, run Skype, use 6 apps that can run on WiFi, send a text, change settings on my phone, change my battery, stream NFL mobile all at once? People can be so ridiculous sometimes... Skype to Skype calls are free...using Skype to call non-Skype customers uses your anytime minutes. Why is that such a bad deal? A couple things.. 1. Data speeds over wifi should be FAR superior to WiFi, if you find 3g is as fast you probably have slow internet. 2. I don't run skype, but I'm guessing it's an app you run in the background to receive calls. If that's the case, having your WiFi disabled would be a bad feature. I agree that some people get a little over the top on some issues, but this seems like a very valid issue. Corrections to #1 "Data speeds over wifi should be FAR superior to 3g"
Domestic Skype calls use your verizon minutes only international Skype calls do not use minutes. Read the terms. Skype mobile to domestic landline or mobile uses plan mins...skype mobile to skype customers doesn't use plan minutes. Skype mobile to international landline or mobile uses Skype credit account. Reread the terms. I had to take back an Incredible (Verizon)because the whole purpose for me was to be able to use SkypeIn. Turns out this phone could only do Skype on 3G, not at all on WiFi. That was totally worthless to me as i get 1-2 bars of voice service where I live and 3G was dead. Fair enough Verizon charges extra for a Data plan, but at least let Skype function in an area where there is no 3G! I'll just tote my Ipevo S0-20 around with me and save $30+ a month.